We're so excited to be performing again at the fabulous MAC Children's Festival 2017. This year is the 21st year anniversary of the MIssion Arts Council's Children's Festival. We’re so excited to be performing again at the fabulous MAC Children’s Festival 2017. 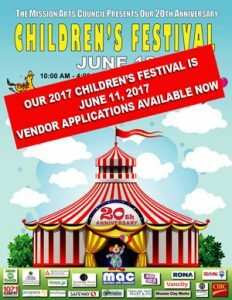 This year is the 21st year anniversary of the MIssion Arts Council’s Children’s Festival. One of the highlights of the Mission Arts Council’s year and a great kick-off to summer, this day is fun filled for children and the young-art-heart. Music, dance, juggling, games, numerous art workstations, pony rides, bouncy balloon and more guarantee smiles and laughter all around. You simply must come out and join us for a fantastic Sunday in the Park! So many amazing events and so many wonderful children in one lovely setting! More information on our performances coming soon!